Joseph, not Pharaoh’s cupbearer or chief baker, is the focus of this passage, and his words and actions illustrate for us what walking with the Lord looks like. First, Joseph is not consumed by his own hard circumstances. He notices that his fellow prisoners are downcast, and he cares enough to ask them questions and to act. Before the Lord ask, Have I become so consumed by my own interests and my own troubles that I don’t notice what’s going on in others’ lives? If you feel the pinching conviction of the Holy Spirit, repent and ask the Lord to open your eyes to others’ concerns, starting today. Joseph points the cupbearer and the baker to God by acknowledging out loud that only God can interpret dreams. Before the Lord ask, Do I openly give God the credit He deserves? Or do I take credit for myself or let others ascribe credit to me? Have I ever squirmed out of speaking of God before nonbelievers by saying, “I got lucky”? Joseph cared about and served Egyptians as an alien and stranger in their land. Pastor Dave noted that we Christians are aliens and strangers in this world. Do we live like Joseph? Or do we insulate ourselves in our own like-minded group, only caring about “us,” not “them”? Ask the Lord how you can care about and serve the “natives” of our culture. Lord, is there some action You want me to take? Someone You want me to engage with? Do You want to change my mindset? Ask the Lord to give you the courage to speak the very words of God, whether it’s welcome news or not, and trust God for the outcome, like Joseph. One small way to serve others is to participate in a Love Our Cities project coming up on April 27 and May 4. Pray that many from Calvary and from other churches in the area will make the body of Christ a visible, positive presence in our communities. This is the abbreviated prayer blog. 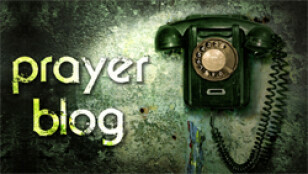 To subscribe to the full prayer blog click here.